The Mokelumne River has been designated wild and scenic, giving it permanent protection from future dams. The Mokelumne River flows west from the central Sierra Nevada. Dams will never be built on almost 40 undeveloped miles of the Mokelumne River, the foothills tributary of the San Joaquin River that provides 1.4 million East Bay residents with most of their water. 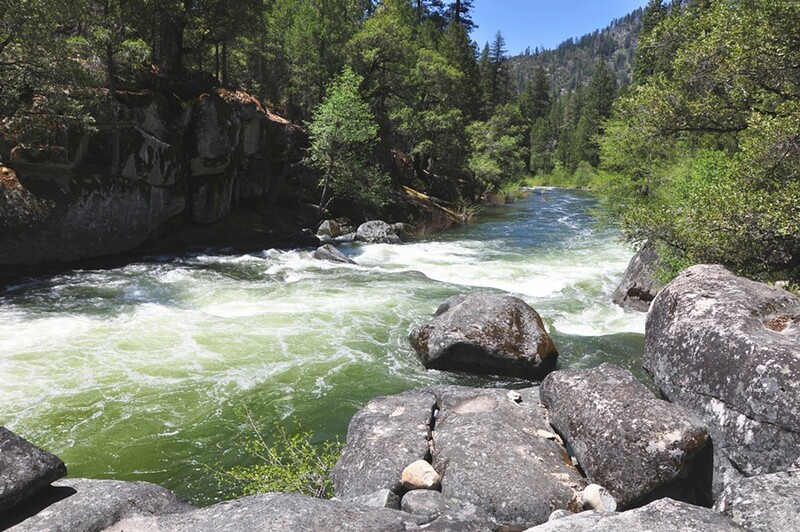 The river — five segments amounting to more than one-third of its length — has been permanently protected under the California Wild and Scenic Rivers Act. The protected status was granted on June 27, when Gov. Jerry Brown signed SB 854, making the Mokelumne the state's 12th river to be designated under the law. For groups like the Foothill Conservancy, committed largely to protecting the Mokelumne, the designation marks the end of a long battle. Now, the river, which runs through multiple reservoirs but also flows through undeveloped wilderness, will have a future free of many of the developments that threaten other waterways. "State Wild and Scenic designation ensures that the river we know and love will be here for generations to come," said Katherine Evatt, an Amador County resident who cofounded the Foothill Conservancy 30 years ago largely to protect the Mokelumne. "It means that 37 miles of the upper Mokelumne will continue to flow freely without new dams or impoundments." In California, about 2,300 miles of river — about 1 percent of the state's river miles — are protected by wild and scenic status. Many rivers with this designation still support relatively healthy trout, steelhead, and salmon populations, making them especially valuable focal points for fishery advocates and conservationists. But the middle and upper portions of the Mokelumne River are blocked by dams, meaning salmon no longer return there. However, the river still has assets in its undeveloped middle reach that make it a gem for river advocates and conservationists, including river rafters. The Mokelumne begins high above the tree line in the Sierra Nevada. At about 4,000 feet above sea level, the Mokelumne's north fork flows through Salt Springs Reservoir, the pool of water contained behind a PG&E hydroelectric dam. Downstream, it continues through miles of rugged, undeveloped country while dropping 3,000 feet in elevation to the waters of Pardee Reservoir, one of the East Bay Municipal Utility District's key water storage systems. The 37 designated miles of river lie between these two reservoirs. Wild and scenic protection ensures that dams will not be built on designated rivers. While the state's 1972 Wild and Scenic Rivers Act — passed four years after the U.S. Congress implemented a federal law by the same name — also stipulates that existing uses of a river for recreation and water supply shall not be impacted by the designation, it generally means that future water development projects may be restricted. For this reason, some water providers are leery of the law. The Amador Water Agency, for instance, has been lukewarm to the idea of protecting the Mokelumne, chiefly because of predictions that local demand for water will spike in the decades ahead. In a 2017 report assessing future water needs, the agency expressed "significant concern" that designating the Mokelumne as wild and scenic would impede access to water "needed to meet agricultural, commercial, industrial, or institutional water requirements." However, through a collaborative negotiation process involving several environmental groups and water agencies, guarantees were written into the legislation that address this concern while still protecting the river. "We were opposed to the Mokelumne River's designation of Wild and Scenic in the past due to the lack of such provisions and with their inclusion, we actively supported legislation to add segments of the Mokelumne River in the California Wild and Scenic [Rivers] Act," Gene Mancebo, general manager of the Amador Water Agency, wrote in an email. The East Bay Municipal Utility District has also voiced support for the designation, as long as it would not impact the water agency's water rights, facilities, and operations. (It probably won't.) Though East Bay MUD once hoped to expand the size of Pardee Reservoir — a plan that drew strong pushback from river advocates, including trout fishing and river rafting enthusiasts, and which would be impossible with the new wild and scenic status — the water agency is now looking at other measures for bolstering its supply, including more groundwater storage and enhanced conservation. River advocates and other environmentalists believe demands for water can be met through conservation and improved efficiency of use, both in residential and agricultural applications. Evatt said local water agencies have used unrealistically high human population projections and per capita water usage to calculate the future demands for water. She said she's confident that the provisions added to the Mokelumne legislation create "a path forward for the water agencies" without compromising the protective purpose of the law. "The Mokelumne's Wild and Scenic designation basically makes it clear that people can still apply for new water rights on the river, and the state can review and grant them as long as those rights wouldn't impede or harm the free-flowing and natural character of the river," Evatt said. "We're comfortable that the river is completely protected and that the new provisions didn't compromise anything. We wouldn't have supported [the added provisions] if we weren't."